MFAC relays provide high-speed differential protection for various types of power system plants including generators, reactors, busbars, motors and the individual windings of power transformers. Providing high-speed differential protection, the MFAC relay is fast and reliable due to its simple electromechanical construction. 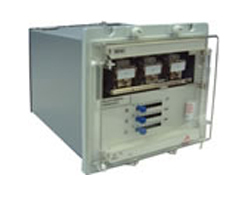 It operates as a high impedance unit protection scheme and has a wide range of settings. The MFAC relay operates as a high impedance unit protection scheme, with settings determined by a series of resistors. The resistors are selected on a seven-way plug bridge. MFAC 14, a single element version, is applied only when earth fault protection is required. MFAC 34, comprised of three elements, provides both phase and earth fault protection. Ensuring high stability with through faults, MFAC relays benefit from a simple application technique. With 'tuned to rated frequency' and a wide settings range, the MFAC has a robust and straightforward design.